Thank you for your interest in interning at Food First. Interns have played an important role in all aspects of Food First’s work since it was founded in 1975. Food First interns work with staff on specific projects for 15 to 40 hours per week for a minimum of three months. Internships generally consist of conducting research; writing blogs and newsletter articles; doing Food First outreach at local events; assisting with communications including writing press releases and updating media lists; and copyediting and proofreading; and grassroots fundraising with supporters who give what they can. Food First interns are treated as an integral part of the team and are not relegated to menial office tasks, though you will be expected to do your share (no more than 20 percent-time) performing administrative duties. Food First internships are unpaid, though we will do our best to assist you in securing funding for your internship if such opportunities are available to you. Interns must work on-site at our Oakland office for at least part of their internship, depending on the arrangement made with their supervisor. Internships generally fall under one of three categories. In addition to the skills outlined above, Food First occasionally accepts interns who are passionate about our mission and have skills and experience in the following areas: graphic design; desktop publishing; web development (Word Press); the publishing industry; marketing; journalism and business. Food First interns gain invaluable experience working for an internationally respected think tank. Food First is a dynamic environment for networking with local and global organizations, social movements, NGOs, scholars and activist working in a broad range of fields related to social justice in food and agriculture. Though interns are expected to be mostly self-directed, Food First staff work with interns to improve their analytical and writing skills. Most of our interns complete their internship with one or more publications to their name—though this is not guaranteed—giving them valuable writing samples for pursuing a career or graduate study related to food justice and food sovereignty. Food First offers a flexible work schedule, depending on your availability and the nature of the project you are working on. If you have the opportunity to receive college credit for your internship, Food First is happy to do whatever possible to help you meet your requirements. We are also willing to provide a reference or letter of recommendation upon completion of your internship. Food First provides lunch every day to staff and on-site interns, though you will be expected to contribute to kitchen and/or garden duties. 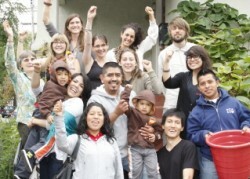 Interns receive discounts on Food First books and Food Sovereignty Tours. *If you require advance confirmation of acceptance to our internship program (e.g. because you are seeking financial assistance to support your internship) you are welcome to submit your application in advance of this deadline. Please specify in your cover letter which internship period you are applying for and how soon you require a response. To be sure that we have received and are processing your application, you may follow up by calling (510) 654-4400, ext. 223. For all internships, please email application materials to internships@foodfirst.org. Two writing samples that demonstrate your ability to convey ideas and arguments in a clear and concise way. These may be blogs, college papers, grant proposals, newspaper or magazine articles, etc. There is no length requirement for the writing samples, but they should preferably each represent a complete piece of writing, e.g. a full blog, thesis-chapter or article (as opposed to an excerpt). Please note: For the Development and Communications Internship, at least one of your writing samples should demonstrate marketing/promotional or technical writing skills, e.g. a press release you have written, promotional language for an event, proposal, fundraising appeal, etc. Click here to read what past interns and colleagues have said about their experience at Food First.